In 1957, architects Eva and Niels Koppel gave Poul Henningsen the task of designing the lighting for the new Langeliniepavillon restaurant in Copenhagen. The result was a pendant lamp, The Artichoke, in which the functional combines with the aesthetic. Technically seen The Artichoke came into being based on 30-year old sketches of Poul Henningsen’s Septima lamp, based on PH’s typical tiered shades. This meant that development of The Artichoke went so quickly that it could already be hung the same year. As the leaves of the lamp resemble an artichoke, the lamp has since been given the name The Artichoke. From the start, The Artichoke was produced in three sizes: 84, 72 and 60 cm in diameter , and in three versions: matt copper, stainless steel and white lacquer. 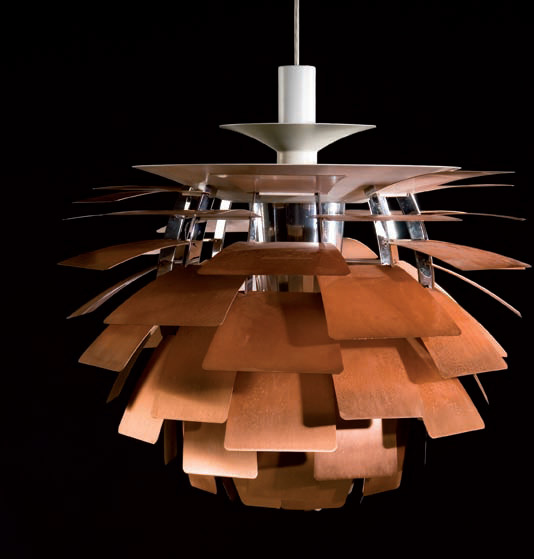 As a result of the great demand for The Artichoke in 2004 Louis Poulsen made a smaller version with a diameter of 48 cm, better suited for use in the home.